When Justice Nicola Byer sentenced Matthew Hazel to nine years imprisonment after he committed attempted robbery and attempted murder, some members of the community expressed dissatisfaction, adding that the punishment does not reflect the seriousness of the crimes perpetrated against a member of the Royal Virgin Islands Police Force. In fact, the Crown had presented the police officer’s profession among the aggravating factors, which essentially are negatives stocked against Hazel. But, in her written judgment published yesterday, Justice Byer declared that, in sentencing Hazel, she did not give credence to the fact that the victim of the crimes is a police officer – Durville Carty. The judge stated that there is no evidence the offender knew the victim was a police officer at the time the offences were being committed. “In relation to the submission made by the Crown that the virtual complainant having been a police officer added to the aggravation of this incident, the court disagrees,” Justice Byer declared. “In the instant case, the evidence led clearly indicated that it was not until a chase ensued between the complainant and the defendant that the complainant identified himself as a police officer,” the judge said. She further stated that, in arriving at the sentence, she did not support the Crown’s argument that one of Hazel’s negatives is that he showed no remorse throughout the case. “As it relates to the reported lack of remorse, I do not agree that this is an aggravating factor in circumstances where the defendant (Hazel) has clearly stated that he did not do this act, albeit accepting the verdict of the jury,” Justice Byer said. She added that Hazel has been consistent with his plea of not guilty, and “it would be extremely disingenuous that he now utter regret or remorse”. According to the judge, the Crown’s aggravating factors she accepted were that the offender had a firearm that was discharged, the offender concealed his identity with the use of a mask, and the offender committed the crime at night (after midnight). Justice Byer, in the meantime, noted the mitigating arguments that Hazel’s lawyer Valerie Stephens-Gordon presented in seeking lenience for her client. The judge said she considered – among other things – the fact that Hazel committed the offences at age 23. At the time he committed the offences, Hazel was employed to First Caribbean International Bank in Road Town – the said bank where the police officer was almost robbed and murdered. Hazel’s former supervisor at the bank spoke highly of him. “By all accounts, it appears these offences were outside any usual or normal behaviour for the defendant. And his former supervisor at First Caribbean International Bank where he worked at the time of the incident, told the social worker that she was taken aback when she learnt that the defendant had been involved in the offences, and that she considered it ‘out of character,” the judge said. Meanwhile, the facts of the case are that a security officer employed to One Mart supermarket contacted the complainant (police officer Carty) on the evening of February 16, 2015 to assist in depositing money. Carty, who was not on roster that night for duty, placed himself on duty and retrieved his police force-issued firearm, and went to One Mart supermarket. He collected the money earned for the day and transported it to First Caribbean International Bank for deposit. Just before he made the deposit, Carty was confronted by a gunman who was wearing a mask. While he demanded the money, the gunman discharged his firearm three times at Carty. Carty was able to retrieve his own weapon, which was concealed on his person. He returned fire and pursued the gunman, but lost him. 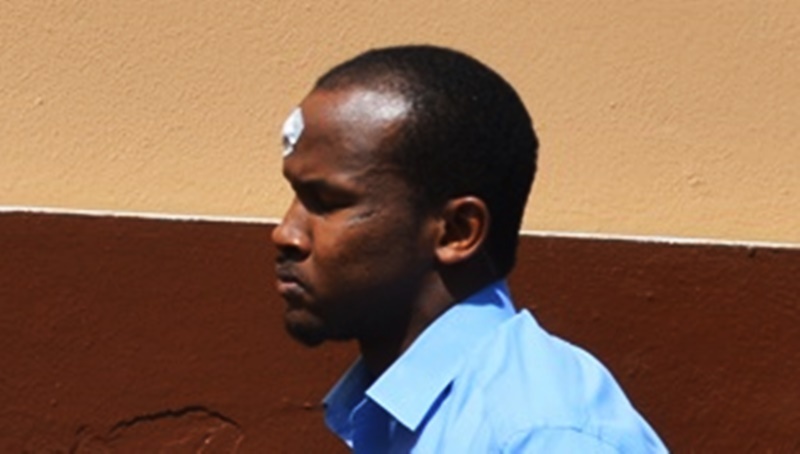 According to the judge, the Crown relied on CCTV footage retrieved from the area of the bank, Peebles Hospital, and the environs of Road Town, which captured the movement of a vehicle “admittedly driven” by the convicted man. The footage also shows the convict travelling to Peebles Hospital where he sought treatment for a gunshot wound on the same night the crime was committed. “The crown also relied on DNA evidence obtained from the mask that was identified as the one being worn by the assailant, which had the DNA of the defendant (Hazel),” Justice Byer said. Hazel’s defence was that he was an innocent civilian who was caught in the cross fire between Carty and a gunman. The jury however rejected that defence resoundingly, and unanimously found Hazel guilty of all the offences as charged. Hazel was charged with attempted murder, attempted robbery, possession of a firearm with intent to commit an indictable offence, and possession of explosives.